Our straightforward style sheets present formatting information in a way that's easy to understand. Each style shows a preview and exactly what formatting it enforces. Editing a style is likewise made simple. Just select the style and apply formatting using regular tools like menus, palettes, and toolbars as usual. 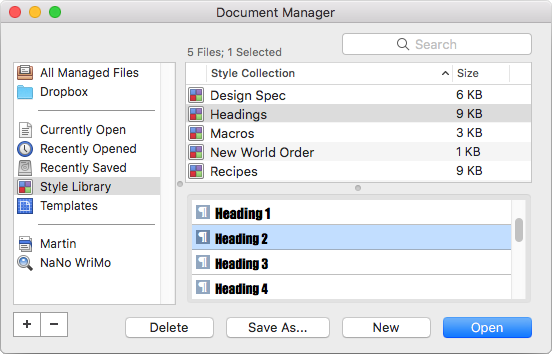 Use list styles to control not only counting and numbering, but also text formatting for each level. Advanced note styles allow great flexibility in the display of your footnotes and endnotes. For more details see our footnotes and endnotes tour page. You can customize the keyboard shortcut for any style. Our multi-key shortcuts make recall that much easier. For example, use Command + H1 for Heading 1. Fully customizable keyboard shortcuts are available for any menu command, not just styles. Quickly save and load whichever styles you use most. Read more in our user guide's help topic about Style Sheets.